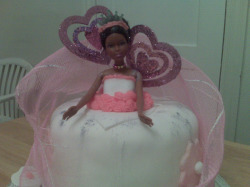 After surfing the web for about a week looking for a Barbie cake to make for my two grandchildren's sleepover, I came across a web site with a tutorial. I watched and learned. I purchased the rolled fondant and other ingredients and crossed my fingers. I have never worked with fondant and had never heard of it. I took a deep breath and got started. I prepared the cakes from scratch, flour, sugar, eggs, sour cream,...etc (homemade pound cake), and refrigerated like instructed. Once the cake were cooled enough, the fun part started, DECORATING, I rolled the fondant with a rolling pin, and placed it on the top of the cake, being careful not to tear the fondant. I proceeded to smooth the fondant over the cake and returned back to the refrigerator. Once this was done the cake was ready for decorations. I placed Barbie in the center of the cake, (i used a bundt pan), filled the hole in with icing and some pieces of cake that I shaved off the make the cakes even. I then positioned Barbie and packed buttercream icing all around her so she would not move, returned cake to refrigerator again. I used tubed icing with a rose tip, some hearts from Valentines day and some netting to make a glowing effect, (along with the sparkle glitter)and to my surprise, it all came together. What a beautiful cake and a great idea to use the bundt pan! I am going to attempt to make one for my dtr's 5th bday next month & didn't want to buy a special pan. THANKS for your idea!!! It is simply beautiful - the folks that received it are so lucky! This cake turned out amazing! It so creative and such a great idea! I wish you could make me one! Your cake is so beautiful, I think you should continue to make art. This cake is beautiful! What an amazing gift/talent, to be able to create something so beautiful. YOU ARE THE BEST BAKER EVER! I would pay at least 500 dollars for this cake. You are an amazing talented baker and I would love to see more. I have a feeling you make great pound cake. A very impressed student worker. Very sweet...you did a great job! Keep making cakes and sending them in!